While many of us personalize our phones with stylish cases and decals, we leave these works of art simply lying on a desk or bedside table ignoring the balance of form and function they provide. Fortunately WaveCradle saves us from iPhone mediocrity. The primary purpose of WaveCradle is to enhance and amplify the audio output of your iPhone without the use of speakers or other extra hardware. The WaveCradle uses natural acoustics to direct the sound to the listener via its curved design. When listening to music or a phone call, the audio output is noticeably louder without being distorted. This won’t replace a traditional speaker but for casual desktop use it works great. Just like your iPhone, WaveCradle isn’t just functional but a dream to look at. It comes it two styles, classic and low profile, as well as three different colors (I opted for traditional black). The sloped bottom makes it look like your iPhone is lounging in the lap of luxury rather than carelessly laying down on a table top. Your iPhone stands at attention ready for action, but at a slight recline just to let you know it likes to let its hair down on occasion. My only complaint with the WaveCradle is that there is no pass-through for charging. To charge the iPhone while its in the cradle, you have to garishly cover the front with your charging cable. Ruins the illusion of perfection! You’ve got to put your iPhone down sometime, so you might as well add some functionality. 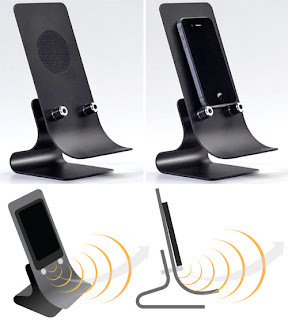 Pros: Stylish way of storing your iPhone and amplifying sound.